Dr. Fumio Inagaki has been awarded the 2015 Asahiko Taira International Scientific Ocean Drilling Research Prize, or “The 2015 Taira Prize” for short, by the American Geophysical Union. 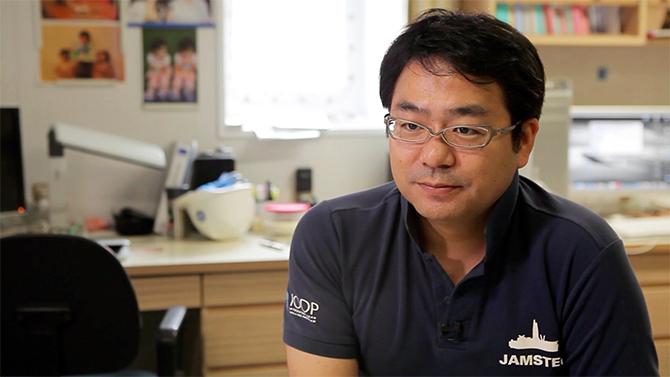 Dr. Inagaki is the Deputy Director of JAMSTEC’s Kochi Institute for Core Sample Research, and also the head of the Geobiotechnology Group at Research and Development Center for Submarine Resources, JAMSTEC. The Taira Prize is awarded to early- and mid-career researchers in recognition of “outstanding transdisciplinary research accomplishment in ocean drilling.” The inaugural “The Taira Prize” award ceremony and commemorative lecture are scheduled for the AGU Fall Meeting to be held in San Francisco in December 2015.